These festivities hark back to one of the Principality's oldest traditions, a tradition which has left its mark on the national culture in areas as varied as religion, folklore, popular beliefs, history, literature, the arts, painting, music, numismatics and philately. 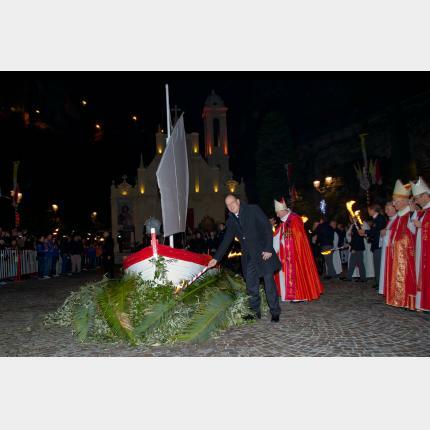 It originates in the "Legend of Saint Devota" transmitted in a mediaeval document, a tradition which has held a privileged place in the hearts of the Monegasque people and has persisted over the Principality's centuries-old history. The legend recounts that Devota (Dévote in French) was a Christian girl, martyred in Corsica by the Prefect Barbarus under the Emperors Diocletian and Maximian circa 303/304. Her body was removed the following night by her fellow Christians, placed in a small boat, taken to Monaco and buried in a chapel in Vallon des Gaumates near the Port on 27 January of the same year. Saint Devota became Patron Saint of Monaco under the first Prince, Honoré II, in the 17th century. 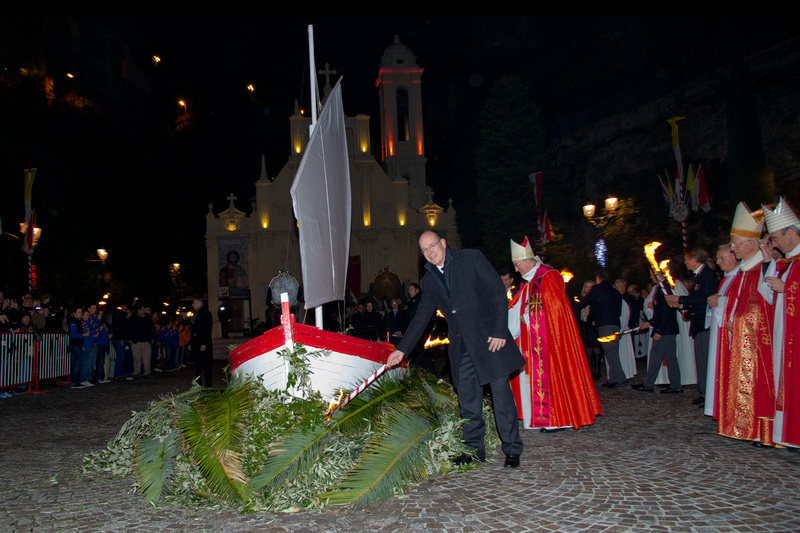 Since 1874, the tradition has been perpetuated every year: a boat is burned on a pyre in the presence of the Grimaldi Family accompanied by Monegasque personalities. After the boat has been burned, fireworks light up Port-Hercule. On 27 January, the Feast day, mass is celebrated in the Cathedral by the Archbishop of the Diocese of Monaco. This ceremony is attended by the Prince's government, the elected assemblies and the constitutional bodies and many faithful. After the ceremony, a procession with the participation of the Penitents of the Archiconfrérie de la Miséricorde heads for the Palace of Monaco with the shrine containing the relics escorted by the Prince's Carabiniers. The procession stops in front of the Palace. A guard of honour and the Carabiniers greet the Saint and the procession then moves on to the ramparts. The Archbishop then presents the relics to the Palace, the Principality and the Sea, asking the Saint to protect the Sovereign, the Grimaldi Family, Monaco and its people.